Other features include adjustable nail spacing guide and settings, a sliding nail loading mechanism, power-driven, stackable arm nails, and a quick-adjust corner clamp. It easily drives all nail sizes and can be used on hard or soft moldings up to 2½" wide. Overall size is 5" × 11½" × 3". 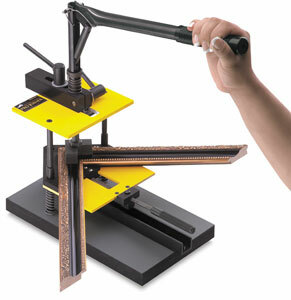 To view a PDF of the Instruction Manual for the Logan Pro Framing Joiner, please click here. This video shows how to use the Logan F300-2 Pro Framing Joiner tool.